We departed from Fatima in Portugal to our next stop, Sintra, but we made a detour at Cabo da Roca to see the raw Atlantic Ocean also the end of Western Europe. On our way, we passed by the Windmill farm in Portugal which were also built on top of the mountains, similar to the Windmill farms I saw in Dabancheng Xinjiang China and Palm Springs USA. Cabo da Roca is located at the top of the mountain so you need to drive through the mountain road before reaching the cape. You will also pass through some Portuguese villages in this remote land. The mountain ride took us about 15 mins to arrive at the top – Cabo da Roca. Learn the top 10 things about Cabo da Roca so you don’t miss out anything when you visit this place. Cabo da Roca is located at the westernmost point of continental Europe. It is a gorgeous cape overseeing the Atlantic Ocean. Congratulations you have reached the westernmost point of Europe. The place is full of tourists as there are no entrance fees to visit this place. However, there are still a lot of spaces to walk around and shoot pictures. You will see a stone monument with a cross with an inscription on the side and there is a quote from the famous Portuguese poet Luis Camoes (1524-1580) who talked about the sea as “Where the land ends and the sea begins”. Make a lot of sense if you are standing a the end of the land. Cabo da Roca lighthouse was built in 1772 and it is the oldest lighthouse along the Portuguese coast. It makes a very stunning backdrop for your pictures. I love the red beacon at the top. 5. How Long do you need? You can spend about half an hour to an hour exploring this place. To be honest, not very much to do but you can walk on the coastal path & enjoy the wind and scenery. At times, the wind can be very strong so please be warned and do not wear any hat and stay warm. On the other end, you also see the stunning granite boulders and sea cliffs along the coast. The formation of the big granite boulders caused by wind and sea is really beautiful to look at. Cabo da Roca was dedicated to Peace in 1999 as part of the “Sri Chinmoy Peace-Blossom Project”. Since 1986, many significant landmarks around the globe — from natural wonders to entire nations — have been dedicated to peace as part of the Sri Chinmoy Peace-Blossoms programme. 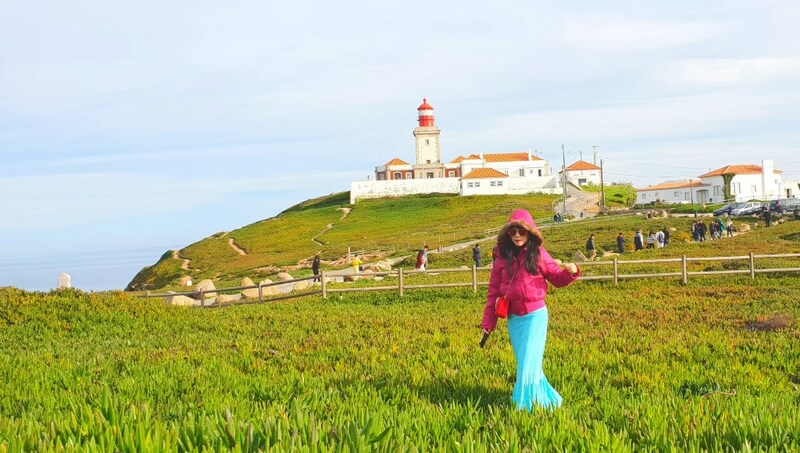 There are over 900 landmarks around the globe and one is Cabo da Roca. Go find this peace plaque. There is a small cafe restaurant for you to get your coffee, tea, snacks & toilet. You get to see these beautiful ceramic tiles everywhere when you explore Portugal & Spain, it is called Azulejos tiles. The colorful tiles are the dominant feature in every Portuguese city and villages. Azulejos tiles were usually decorated in the simple color palate but dominated by blues and whites. Some other popular colors are yellow, gold and green. I really love how they incorporated into the wall which makes it really pretty and unique. Cabo da Roca is about an hour drive from Lisbon, half an hour from Sintra and 2 hours from Fatima. If you are traveling to Sintra, you should stop by Cabo da Roca to step foot on the westernmost of Europe continent. A good half an hour to an hour is good to explore this place. Macau Fisherman’s Wharf – Is it worth to visit? New places, unknown places, places to discover and explore! I love! This seems like a great opportunity to get some great photos! I hope to visit France in the next 5 years so this will be on my list as a stop through! Europe travel is at the top of my bucket list and I am saving for it. Great article, I am saving it for when I plan my itinerary. Thanks for sharing. It’s always nice to know what to expect before visiting a place. I would love to be by that cliff overlooking the ocean. That spot looks calm enough for me. It looks like a very remote place. But you have had a very wonderful touch of nature there. What an amazing view! Looks so relaxing. Nothing like experiencing new adventures. It’s great that the entrance is free and that it’s not that crowded. Last year I finished my Travel bucket list (which is strange but true)…now I am making a new travel bucket list for next 5 years and I am going to add Cabo Da Roca in Portugal. This place looks beautiful and breathtaking! What an amazing adventure! I would love to visit Portugal someday. That lighthouse looks so intriguing. I’d love to visit it someday.